Kenneth Rijock's Financial Crime Blog: HOW MANY IRANIANS ENGAGED IN SANCTIONS EVASION HOLD DOMINICA DIPLOMATIC PASSPORTS ? 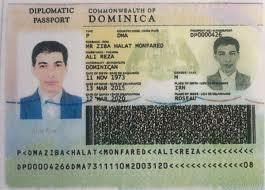 HOW MANY IRANIANS ENGAGED IN SANCTIONS EVASION HOLD DOMINICA DIPLOMATIC PASSPORTS ? The disclosure that the Iranian CEO of Malta's Pilatus Bank holds a Dominica passport this week, which we learned in the aftermath of the New York arrest of the bank's owner, on Federal sanctions evasion and money laundering charges, begs the question: just how many Iranians engaged in the billion dollar international sanctions evasion scheme have Dominica diplomatic passports ? The bank's owner is himself known to have a St Kitts & Nevis passport; what else is in his pockets ? The issue first surfaced when Alireza Monfared, a partner of sanctions evasion kingpins Reza Zarrab, was arrested and returned to Iran. Monfared used his Dominica diplomatic passport to evade arest in Malaysia. Zarrab, at the time of his arrest, had obtained valid passports from at least four countries, and is suspected of having applied at various CBI jurisdictions, including Dominica, St Kitts and Malta. Which ones he obtained is not publicly know, but Dominica is at the top of the list. Babak Zanjani, another sanctions kingpin, who had a death sentence imposed upon him in Iran, is suspected of also having several CBI passports, including in Caribbean jurisdictions. It is the practice of members of his sanctions syndicate to hold several valid passports, to foil criminal investigators seeking to track their activities. The partners of the Zarrab/Zanjani/Monfared syndicate, who are not in custody, and who reside outside Iran, have reportedly offered to pay the $3bn Zanjani stole from Iran, to erase his death sentence. We must assume that all of them are in possession of a fistful of CBI passports, especially Dominica diplomatic passports. Therefore, we ask the question again: how many Iranian sanctions evaders, international career criminals all, hold illegal Dominica diplomatic passports ? All of them ? No wonder Dominica's Minister of Foreign Affairs, Francine Baron, refuses to release the list. It would implicate her in Iran's international sanctions evasion scheme, as a co-conspirator, as well as a money laundering conspirator, due to her acceptance of cash from them, to acquire the illicit documents.